by Jillian Ball and Geoff Gaff, December 2004. Traces of cable trams are scarce in Melbourne, although Melbourne once had the world's most extensive network of cable trams. They gradually disappeared from the streets of Melbourne between 1927 and 1940 after 50 years of service. Engineering feats were accomplished on Melbourne's flat terrain, which was quite different from the steep grades in Austria, where cable haulage originated, or San Francisco, where it evolved for public transport use. The engineering difficulties specific to Melbourne were those of rounding a curve and crossing an intersection with another cable. The Colony of Victoria was proclaimed in 1836 and soon small horse-drawn trams were providing public transport. The drawbacks with horses were that they required stabling, feeding and manure disposal. Cable trams were introduced by Francis Clapp, an American businessman with an interest in street rail-based public transport, and they proved to be popular, non-polluting and almost noiseless. From 1885 to 1940 cable trams dominated the city's public transport with efficiency and pride. 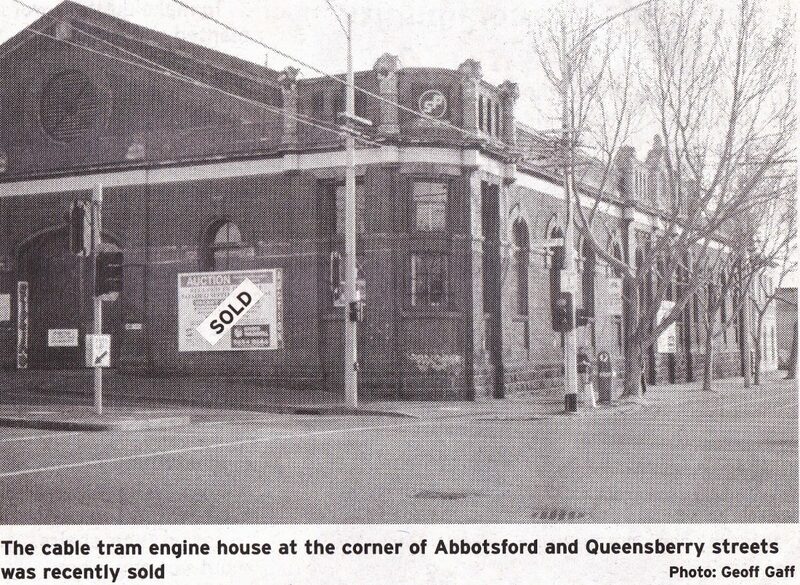 The North Melbourne Engine House at the corner of Abbotsford and Queensberry streets was completed in 1889-1890 and was one of the last of the 12 engine houses in the system to be built. The building housed a coal-fired Babcock and Wilcox water tube boiler which drove a Galloways Compound Reversing Engine attached to a 24-foot winding wheel. The chimney, like those of many other engine houses, was 150 feet high and dominated the landscape. It ruined many a washday before efficiency in steam-driven engines improved years later. The engine house building was architecturally prominent, built, as was the tramway, from superior materials while resources were richly available in the years following the gold rush. Engine houses were tourist attractions because of their cathedral-like interiors and intriguing massive winding equipment. The North Melbourne Engine House supplied three cables to the system. All started at the engine house. The first ran north along Abbotsford Street and terminated at Flemington Bridge, the second in the opposite direction, turning into Spencer Street and running east to Lonsdale Street. The third ran along Queensberry Street, turning into Errol Street, then Victoria Street and terminating at Elizabeth Street outside the Queen Victoria Market. Recently the solidly built engine house was planned to form the basis of a new apartment block. The plan to redevelop behind the façade of the only intact engine house from the cable tram era attracted considerable protest. Its future, however, remains uncertain. Conversion into residential apartments was forestalled and the engine house was put up for auction. It was passed in without a single bid with a reserve of $2.5 million but it has since been sold. After 115 years the engine house stands firm but its heritage needs to be protected. A group of local residents are discussing possible uses. What about making North Melbourne's relic of an almost obliterated past a tramway museum, or a central facility for tourism development? We would be interested to hear readers' ideas.